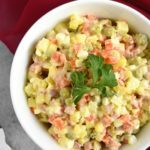 Olivye Salad: classic Ukrainian potato salad! Rich in flavor with creamy and tender ingredients! This salad is a must at big gatherings, holidays and just any day of the week. 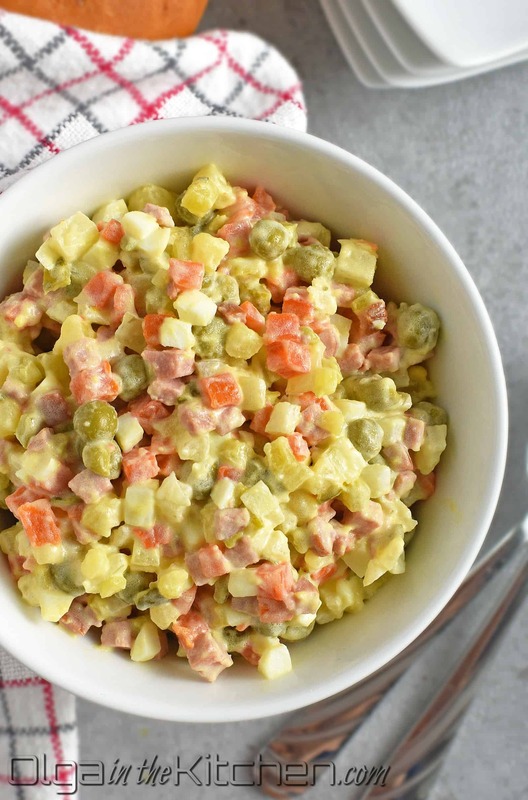 It’s the best potato salad you will ever enjoy! 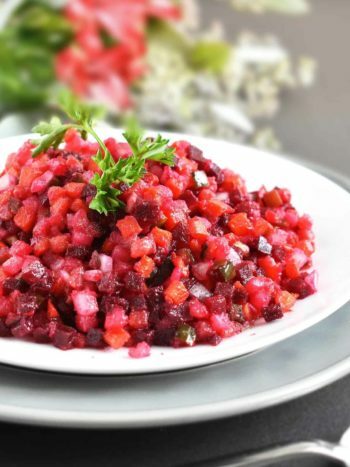 Olivye Salad is extremely popular among Ukrainian people. Everyone calls it the same, but each family has their own version of it that is passed down through generations. This recipe is the way my family had always prepared it. 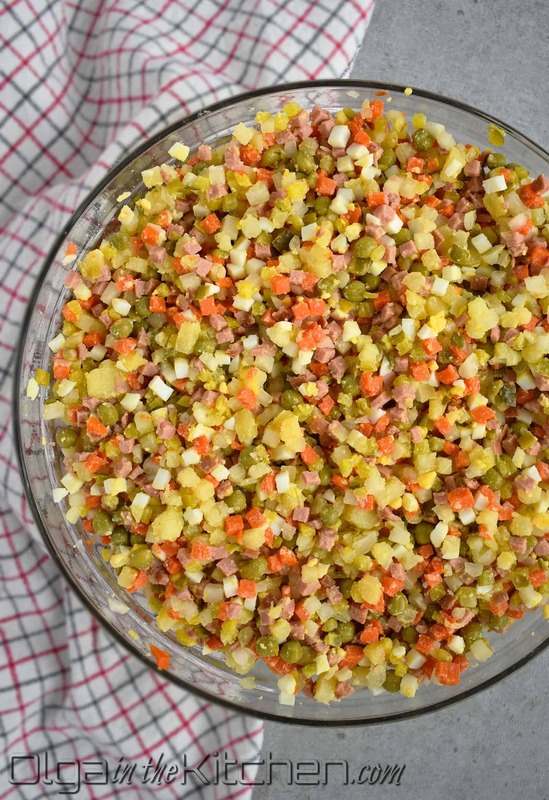 The main idea of this salad is to use potatoes, carrots, meat, eggs, pickles, onions and peas. A lot of times people add fresh cucumbers, frozen or fresh peas, canned corn and garnish with fresh greens for the elegant finish. This salad is always dressed into mayo to taste. 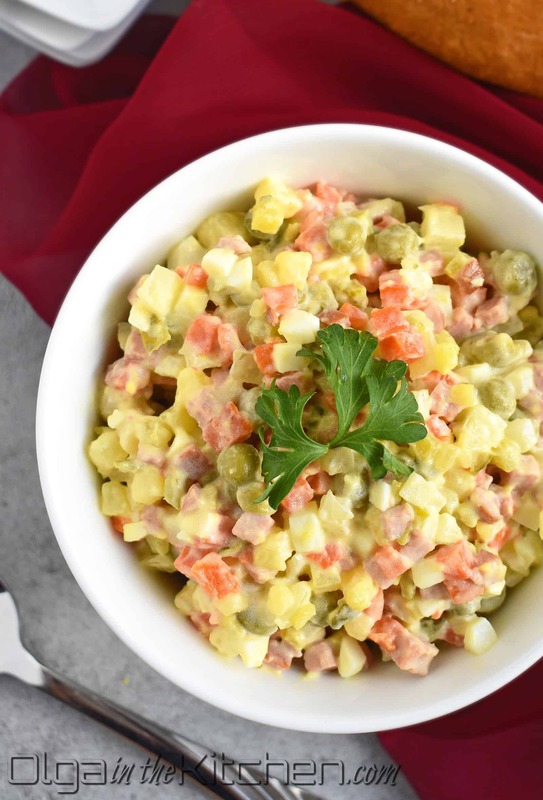 Olivye Salad is very similar to the Vinaigrette Salad – another common dish among Slavic gatherings. The similarity in ingredients and the way each is prepared makes both salads like siblings. This salad is very easy to make especially if you are going to use the Chop Wizard. I highly recommend using the chop wizard because it will save you so much time and your salad will have same sized cubes of every ingredient. Please keep in mind to not overcook the potatoes and carrots as they will be hard to slice and harder to chop. Do not peel the vegetables. In a medium pot, place 2 large potatoes and 2 large carrots. Cover with water, bring to a boil over medium-high heat, reduce the heat to low. Cook the carrots for 15-20 mins and take out with kitchen tongs or couple forks, and potatoes for 30-35 mins. (Pierce with knife to check if vegetables are cooked through before taking them out. Do not overcook!) Boil 7 eggs according to this post, “Perfect Hard-Boiled Eggs”. In a medium saucepan, place 1 (15 oz) ballpark franks covered with water. Bring to a boil, cook for 2 mins and drain once cooked. Let the cooked ingredients stand at room temperature to cool before peeling and chopping. Thinly slice 46 oz jar kosher pickles (8-9 pickles). Chop the pickles onto the Chop Wizard and transfer into a sieve lined with a soup bowl. Set aside for pickles to release the excess liquid. Peel potatoes, carrots and eggs. 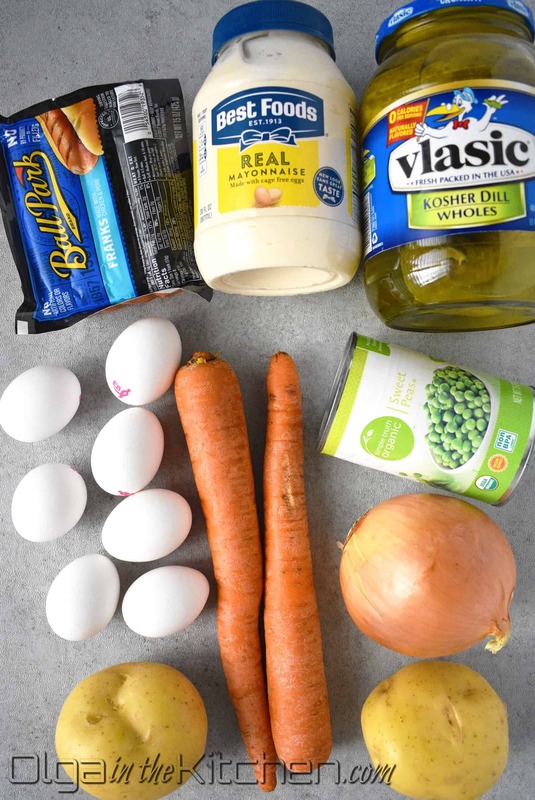 Thinly slice 1 large yellow onion, 15 oz chicken/pork franks, 2 large carrots, 2 large Yukon potatoes, and 7 boiled eggs. Chop the sliced ingredients using the chop wizard and transfer into large salad bowl. Squeeze the juices from the pickles with your hands and add to the salad. (it’s important you do this step to prevent the salad from dripping with excess amount of pickle juice). Rinse 15 oz canned peas in cold water and add to the salad. Gently stir the salad with a spoon. Potatoes tend to get sticky, so you’ll kind of have to break them. Refrigerate the salad without dressing. Dress the salad into mayo before serving. 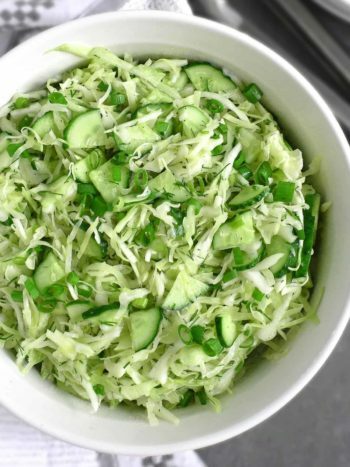 This salad is good up to 4 days in refrigerator without the dressing. 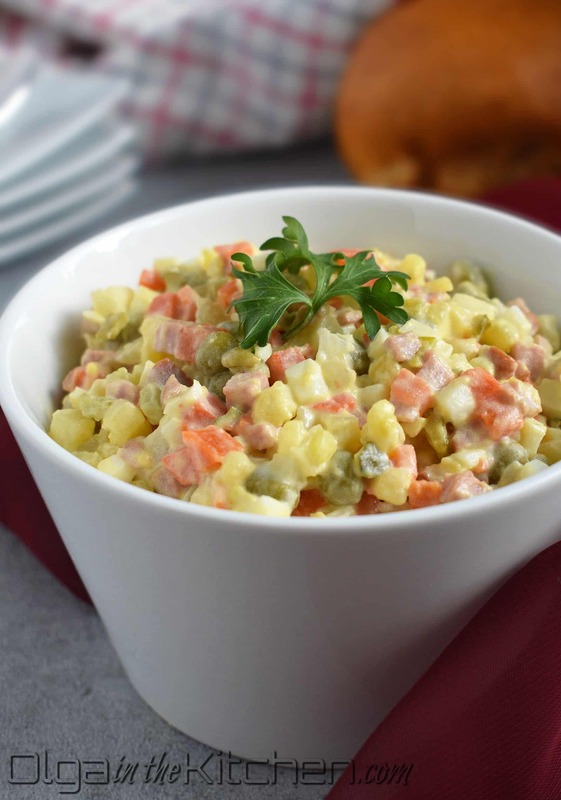 Olivye Salad: classic Ukrainian potato salad; rich in flavor, creamy and tender ingredients! This salad is a must at big gatherings, holidays and just any day of the week! Cook the ingredients: Do not peel the vegetables. In a medium pot, place 2 large potatoes and 2 large carrots. Cover with water, bring to a boil over medium-high heat, reduce the heat to low. Cook the carrots for 15-20 mins and take out with kitchen tongs or couple forks, and potatoes for 30-35 mins. (Pierce with knife to check if vegetables are cooked through before taking them out. Do not overcook!) Boil 7 eggs according to this post, “Perfect Hard-Boiled Eggs”. In a medium saucepan, place 1 (15 oz) ballpark franks covered with water. Bring to a boil, cook for 2 mins and drain once cooked. Let the cooked ingredients stand at room temperature to cool before peeling and chopping. 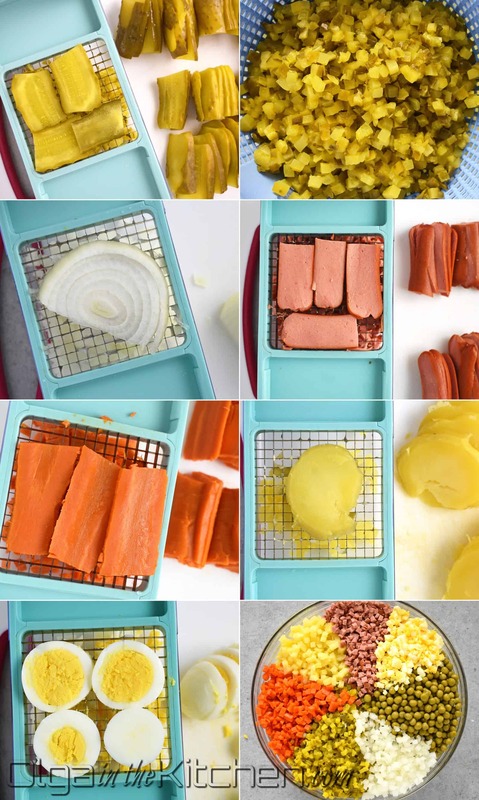 <How to Make Potato Salad:Thinly slice 46 oz jar kosher pickles (8-9 pickles). Chop the pickles onto the Chop Wizard and transfer into a sieve lined with a soup bowl. Set aside for pickles to release the excess liquid. Peel potatoes, carrots and eggs. 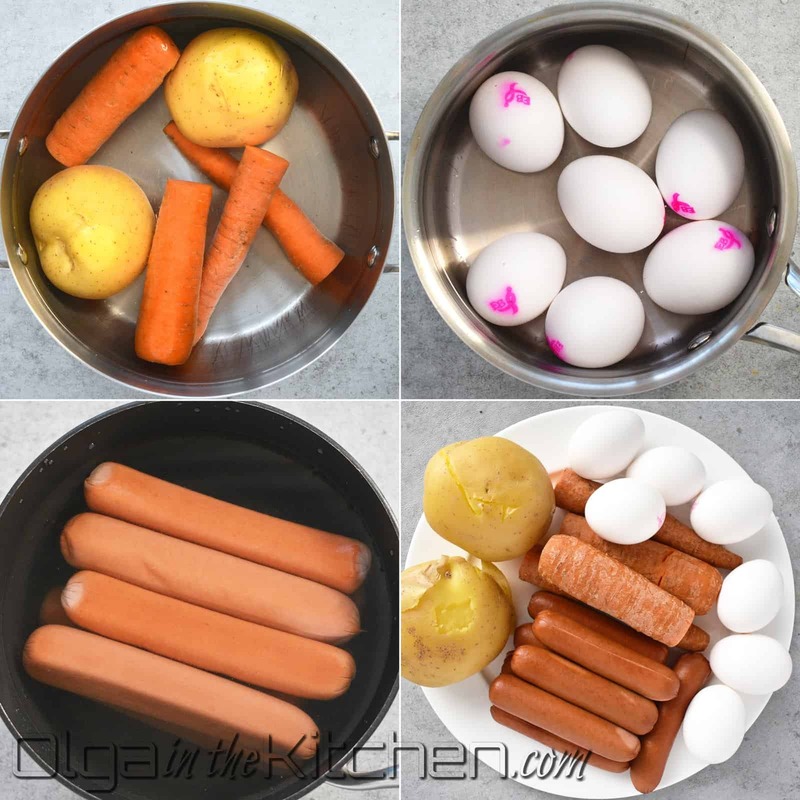 Thinly slice 1 large yellow onion, 15 oz chicken/pork franks, 2 large carrots, 2 large Yukon potatoes, and 7 boiled eggs. Chop the sliced ingredients using the chop wizard and transfer into large salad bowl. Squeeze the juices from the pickles with your hands and add to the salad. (it’s important you do this step to prevent the salad from dripping with excess amount of pickle juice). Rinse 15 oz canned peas in cold water and add to the salad. Gently stir the salad with a spoon. Potatoes tend to get sticky, so you’ll kind of have to break them. Refrigerate the salad without dressing. Dress the salad into mayo before serving. This salad is good yo to 5 days in refrigerator. Hi Olga, I’ve been looking for this recipe for a while and came across yours. 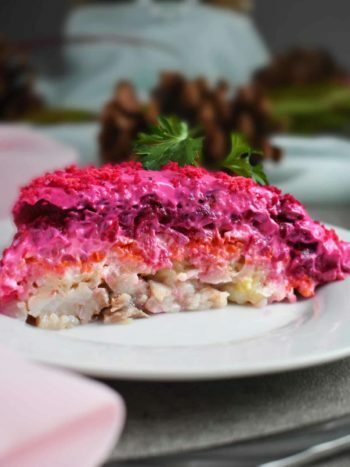 I once tasted this Olivye salad at my friend’s house, she’s from Ukraine and I couldn’t stop thinking about it. Both my husband and daughter loved it as much as I did. I think this is the best potato salad I had ever tasted and it’s so easy to make. I’m confident it will become a staple not just for holidays but on regular day at my house. Thank you!